For some people, the untamed beauty of the bayou is a place to hide. For Louisiana wildlife agent Jena Sinclair, it's a place of refuge - one where she can almost forget the tragedy that scarred both her skin and her soul. But when the remains of yet another fisherman turn up, Jena realizes that Bayou Pointe-aux-Chenes is not safe for her...or anyone else. The mysterious deaths aren't her only problem. A dangerous drug known as Black Diamond is circulating through Terrebonne Parish, turning addicts into unpredictable sociopaths. Jena's investigation leads her to Cole Ryan - a handsome, wary recluse struggling with his own troubled history - who knows more than he's willing to admit. If they want to stop the killer, Jena and Cole must step out of the shadows of their pasts and learn to help each other...before the evils lurking in the bayou consume them both. ©2016 Suzanne Johnson. (P)2016 Brilliance Audio, all rights reserved. I've looked forward to this title since the moment I finished book one. Was well worth the wait. Idk what happened, EG did the narration in the first book. She did a great job on the different voices and good overall. This one was painful to endure, sooo slow, halting and choppy, putting commas where they shouldn't be. There was a rhythm of 5 or so words, halt, continue, repeat. No flow at all. Couldn't finish. I gave the first book 4 stars. Maybe what I liked better about this one, were the main characters and the lack of a serial killer. Still some violence, but most of the story is developing the relationship between the MCs and an investigation into the latest drug smuggling operation in the bayou. Held my attention throughout; really didn't want to stop listening. Okay, so the hunky hermit didn't hurt either! The story began out on a chilling note. It gave me the chills, and of course, I had to continue, as I had to know how the story would unfold. Jenna has been through so much and she bears the physical and emotional scars of her experiences. She has returned to fieldwork after the accident that left her with those scars. She gained a new partner, a new home. A new drug has taken Terrebonne Parish by storm. This drug is addictive, and it makes users’ behavior violent and out of control. Jenna is invested in the investigation as someone close to her has been exposed to the drug. Cole lives his life in recluse determined to escape his past. His story will break your heart. After hearing his story, I understood his reasons for choosing to live as a hermit. There was literally no romance. This is one of biggest peeves when it come to this genre. It is classified as a romantic suspense but when you get between the pages, there is suspense served with a pinch of romance. The characters did not spend lots of time together, so there was no time for their romance to blossom. They were drawn to each other because they recognised they had emotional pain in common. I sensed the magnetic pull between them and I believed they had a connection. The story moved at a pace. There was never a boring moment. At the eighty percent mark, the author stepped it up and at this point, the nail biting feeling came over me. I figured out the mystery from early in the story and as to the parties involved, this too came as no surprise. This however, did not diminish my enjoyment of the book. Instead, it piqued my curiosity as to what their next move would be. I enjoyed the narration. The narrator’s voice was an easy listen. I loved her accents, and I felt she captured the voices of the characters well. Overall, I enjoyed this installment. I will definitely read more from this author. 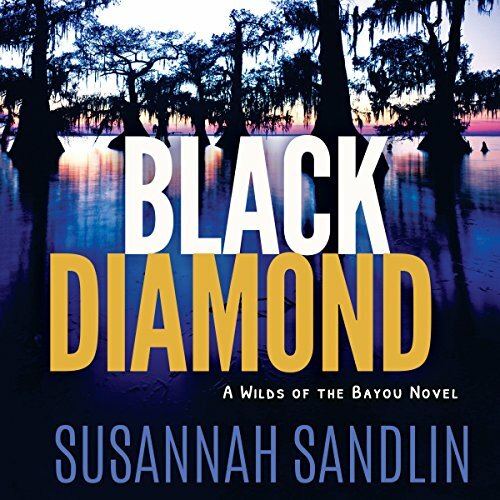 Fans of the genre will enjoy Black Diamond. Loved the story. Great sequel. I really like Susannah Sandlin. I'm from Louisiana so I love the accurate description of the setting. It feels like I'm there. The accents are great! I think the narrator did a fantastic job. It's a great listen! The prologue was a real downer. She made you like someone then brutally killed him. I skipped it. The narrator got a few character voices mixed up. Otherwise it was a good book. It was full of interesting details of the Louisiana swamps and surrounding areas. I like the store. But you can use a better reader. She reads like a kindergarten teacher.